This summer was really my first true vegetable garden. It still wasn’t huge, but I had multiple plants and at times a few more zucchini than any one person should eat in a day. I tried, though. Really I did. The first time I tasted Calabacitas was at our local Chile and Frijoles festival a few years ago. Fair and festival food are generally not Paleo-friendly and my family and I don’t spend a lot of time eating our way through them, but we do like to walk around, soak up the atmosphere, get a bunch of roasted chiles if we’re at the Chile Festival, and support our local community. On this particular occasion, though, there was a stand with a man serving little cups and bowls of zucchini so, being the veggie-lover that I am, I had to give it a try. There are many different ways to prepare this dish but I’ve found that I like it simple. The way I first tasted it, it included squash, corn, peppers, onions, lots of butter, and a sprinkling of queso fresco. It was rich and luscious and love at first bite. 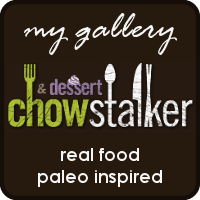 I created different variations over the years, but when I went Paleo 2 years back, I knew I’d need to come up with something that was Paleo-friendly. So out with the corn, butter, and cheese and in with the Paleo-approved fats. This dish is so tasty that you really don’t miss the cheese, and it’s the perfect side dish in summer when your garden is overflowing with zucchini. It goes with any grilled meat and it’s wonderful next to eggs in the morning too. Make any modifications you want – that’s what we do around here anyway. Be sure to let me know if you change something up and it makes your tastebuds sing! 1) In a large sauté pan, melt bacon grease over medium-high heat. Sauté onion for 3-4 minutes, until just beginning to soften. 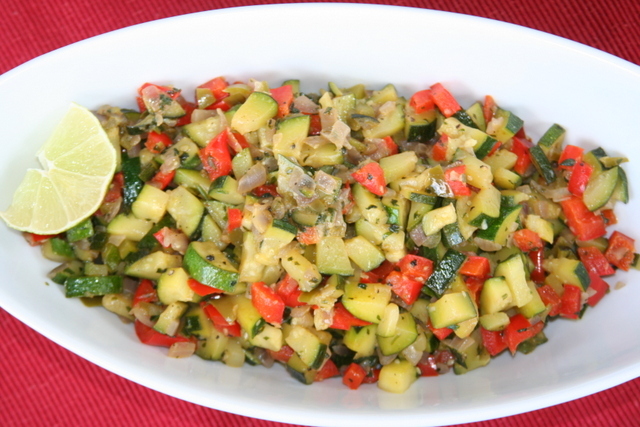 2) Add all the chopped peppers, zucchini, and salt. Stir to coat with the fat and salt. Reduce heat to medium and cook for about 30 minutes, until everything is soft and tender, almost velvety. 3) Stir in the coconut milk and cilantro, additional salt and pepper as desired. A squeeze of lime is nice too. Enjoy! *Note: I don’t really know how many this serves. It never seems to last very long in our house! Just curious on a couple things… Do you consider this a side dish, usually? Also, how do you come up with all your bacon grease? Do you make bacon on a regular basis or do people buy it? Yes – definitely a side dish because there isn’t any protein in it. So good with eggs or anything grilled. We don’t actually eat bacon that often, but I do save the grease when I cook it, as long as it’s good quality, nitrate free bacon. My lard, which I also use, I rendered myself after we got a 1/2 of a happily pastured pig from a local farm. You can purchase lard from US Wellness Meats though. And good quality bacon.